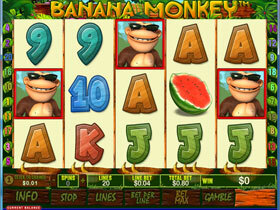 Banana Monkey Video Slot consists of 5 reels and 20 paylines, and has an amusing jungle theme with the main character being the Monkey. This is one of the newest slots in the Playtech family which contains a Wild, Scatter, Multipliers, Game Feature, Free Spins Feature plus a Progressive Bonus Game. This slot has over 36 winning combinations, together with a variety of winning icons which include the Banana Monkey, this icon is also the Scatter icon. The Wild icon doubles up as the Jackpot icon and shows up as stacked. The Wild substitutes all icons except for the Scatter icon and completes winning combinations. The other winning icons are depicted by the Giraffe, Zebra, Watermelon, Coconut, ACES, K's, Q's, J's and 10's. When the Banana icon shows up on the reels, it will fall into a basket that is situated underneath the reel. Players will win 3x the total wager of a spin, including 8 Free Spins when he has collected 4 Bananas at the bottom of the 5 reels. 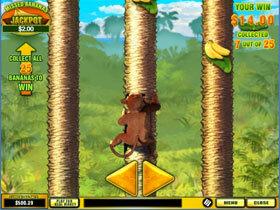 Should a player exit the slot game and then return later, the amount of Bananas that were collected in the basket earlier will still remain the same. For every bet wagered, the baskets will be filled separately. Players will automatically be rewarded with 4 extra Free Spins if a Banana shows up on the reels in the middle of the Free Spins round Unfortunately the Bonus round can’t be triggered while the Free Spins round is in progress. Players will have the opportunity to make use of the Gamble Feature, where they can either double the total amount of their winnings or half of their winnings. In this Feature, the dealers’ card will be face up on the left hand side, and the player must pick one card from the remaining four cards that is higher in value. Players can click on the "Collect" button to collect their rewards and exit the Gamble Feature. This fun and exciting slot contains high quality graphics with superb animations that show up on the reels with every winning combination. Coin denominations vary from as little as 0.01 to 0.50 with a maximum wager of 200 per spin. 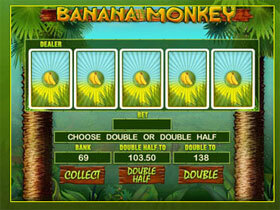 Banana Monkey is ideal for the high-rollers who love games with maximum bets.